Most of our stories today have to do with the elimination of many AQI, and criminals, and the discovery of many weapon caches. Highlighted is the story of a new weapon called the Excalibur that’s guided by GPS! 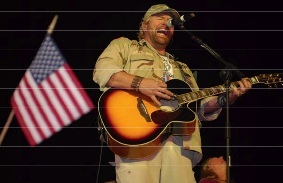 Toby Keith has been so good to our troops, that I’m happy to promote him. BAGHDAD – An AWT and an M1A2 Abrams Tank crew killed 7 criminals in the Sadr City district of Baghdad, April 28, coming under attack by criminals using small-arms fire. An MND-B AWT and an MND-B M1A2 Abrams tank engaged the enemy forces, with the AWT team firing a hellfire missile and killing 4 of the criminals, and the tank crew firing a main round and killing 3 criminals. TIKRIT – Local citizens in the Diyala Province fended off an attack from AQI terrorists, April 28. CF received info from local leaders that citizens and local SoI fought against an enemy attack and killed 12 AQI terrorists. FOB FALCON – MND – Baghdad Soldiers seized munitions, and detained a criminal from Iraq’s most-wanted list in Baghdad’s Rashid district, April 27. Soldiers from Troop C, 7th Sqdrn, 10th Cav Regt, 1st BCT, 4th ID, found a rocket launcher and rocket rigged with command detonation wire during a patrol in the Zubaida community. Also in the Zubaida community, Soldiers from Co E, 2nd Sqdrn, 2nd Stryker Cav Regt, attached to the 1st BCT, 4th ID, detained a criminal from Iraq’s most-wanted list and questioned 2 others. Staff Sgt. Edisson Vargas, and Sgt. Ontario Smith, inspect artillery round components prior to firing an Excalibur round on Camp Taji, northwest of Baghdad, April 26. 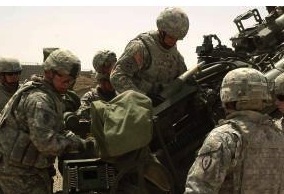 The Excalibur fired was the first round of this type fired by 2nd SBCT while deployed in support of Op Iraqi Freedom. Both Soldiers are assigned to Btry A, 2nd Bn 11th FAR “On-Time,” 2nd Stryker BCT “Warrior,” 25th ID. Staff Sgt. 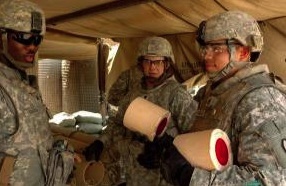 Edisson Vargas prepares his soldiers to fire an Excalibur round. 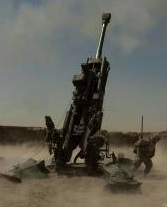 The Excalibur is a specialized round guided by GPS. Pfc. 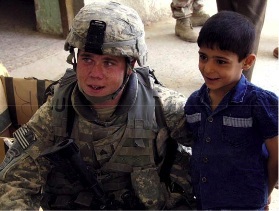 Nolan Laughlin (left), and Spc. Timothy Blair carry an Excalibur round to the M777 howitzer in preparation for firing. Pfc. Nolan Laughlin removes the rotating band protector from an Excalibur round. Pfc. Nolan Laughlin, and Spc. 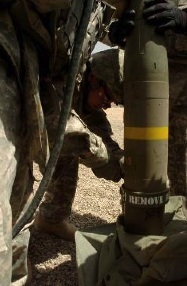 Timothy Blair load an Excalibur round into an M777. BAGHDAD – April 25 – 26, in the Jazeera Desert, Iraqi SOF conducted an op to disrupt insurgent activities and illegal smuggling in the area. During the op, 2 suspected weapons smugglers were detained. During questioning, the wife of one of the suspects told ISOF that her husband conducts attacks against U.S. forces. In Hussayniya, 37th IA Recon soldiers killed 3 Special Groups criminals during an op to prevent Special Groups violence in the area. During the op, IA soldiers came under small arms fire multiple times and returned fire, killing 3 armed individuals. BAGHDAD – Iraqi Soldiers advised by U.S. SF, detained 6 suspected insurgents in Bulayj, April 27. The IA soldiers conducted an op to disrupt insurgent networks operating in the area. Six suspected insurgents, who are reported to have openly threatened the local populace during an insurgent show of force “parade” in Bulayj, were detained. One of the detained suspects is believed to have organized the parade. BAGHDAD – IA Soldiers and Soldiers from 1st Bn, 64th Armor Regt, 3rd ID, attached to 3rd BCT, 4th ID, were attacked by a large group of criminals engaging with small-arms fire while manning a security checkpoint. U.S. Soldiers used 120 mm fire from M1A12 Abrams tanks and small-arms fire to kill the 22 criminals, forcing remaining enemy forces present to retreat. The criminals’ small-arms fire was ineffective and there were no U.S. Soldier or ISF casualties in the attack. BAGHDAD – April 27, at approx. 8:30 a.m. an AWT killed a criminal in northeastern Baghdad after he attacked Soldiers from 3rd BCT, 4th ID, with small-arms fire. Soldiers from 1st Bn, 68th AR, 3rd BCT, 4th ID, killed one evildoer at approx. 10:50 a.m. in northeastern Baghdad after he attacked their checkpoint with small-arms fire. At approx. 12:40 p.m., Soldiers from 1-68 AR returned fire and killed 2 criminals after they fired RPGs at them in northeastern Baghdad. At approx. the same time, Soldiers from 1-68 AR engaged and killed 2 additional criminals after they were attacked by RPGs in northeastern Baghdad. Soldiers from 1-68 AR killed 1 criminal after being attacked with RPGs. At approx. 3:15 p.m., a group of criminals attacked a COP with small-arms fire in eastern Baghdad. Soldiers from 4th BCT, 10th Mtn Div, returned fire and killed 2 of the criminals. At approx. 6 p.m., Soldiers from 1-68 AR were attacked with small-arms fire and RPGs in northeastern Baghdad while conducting a dismounted patrol. Soldiers providing a cordon engaged the criminals with 120 mm tank rounds and machine gun fire from an M1A2 Abrams tank killing 7 of the attackers. BAGHDAD – Separate tips led MND-Center Soldiers to weapons caches in Mahmudiyah, about 20 miles south of Baghdad, and near Patrol Base Warrior’s Keep, April 26. A citizen arrived at PB Warrior’s Keep and led Soldiers from Co D, 1st Bn, 187th Inf Regt, 3rd BCT, 101st Abn Div (Air Assault) to a cache in a field, consisting of 6 mortar rounds of different types and a bag of ball bearings; all of which could have been used to make IEDs. Soldiers from Co A, 3rd Bn, 320th FA, uncovered a stash in a house west of the Qaqa Apartments in Mahmudiyah, containing 6 mortars of different types, a 107 mm rocket, a 57 mm projectile, ball bearings and an IED that consisted of blocks of TNT, as well as other components. BAGHDAD – IA soldiers discovered a large cache containing mortars, rockets and IED-making materials northwest of Yusufiyah, April 26. The cache contained 87 60 mm mortars, 8 155 mm rounds, and 8 Katusha rockets with a Katusha rocket launcher, 16 handmade IEDs, 7 artillery fuses, a 60 mm tube, 8 feet of detonation cord and 2 bags of homemade explosives. BAGHDAD – Country music star Toby Keith visited and performed for troops on Victory Base Complex April 25 and 26 as part of his 6th USO tour. Keith is spending his time meeting with and playing for Soldiers, Sailors, Marines and Airmen across Iraq and Afghanistan. One thing brought the famous musician here, and that was his vast patriotism, and sincere support for servicemembers and the difficult job they do while deployed, which is evident in his music and performances for military members. “His songs are an inspiration to all the troops over here,” said Capt. 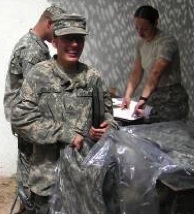 Nicole Van Benken, 62nd Medical Brigade. “It makes you motivated to do your job because you feel like you’re over here for a purpose. 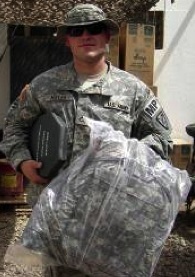 It’s great to know that people support you.” “[Service members] are the never-ending battle for freedom,” Keith said. 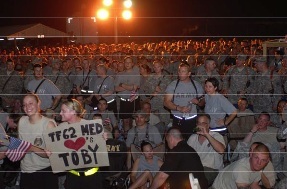 Fans welcome country music star Toby Keith to the Liberty Post Exchange stage at Camp Liberty. In my earlier report I recounted the events in Edinboro, Pennsylvania, where an Iraq War Veteran and his family were assaulted by ‘Peace’ thugs intent on infringing their constitutional rights. The shocking video is now available here. The first part records the efforts to interfere with the filming of a public display at a public protest in a public venue. During this portion two adult females are continuosly in the face of the 15 year old holding the video camera. Pay particular attention to the woman in white as she will play a central role in everything that ensues. Notice her footwear. The Iraq War Veteran and his wife have crossed the street and are now supporting their son and his efforts to video the display the protesters had placed in the public park. In the background at times are two sociology professors from Edinboro University. At one point one of the professors appears to be encouraging the women interfering with the filming. Also visible in the background is a heavy woman in a black T-shirt and blue jeans who is also making a video of the events. That woman is part of the demonstration so presumably it is only the young man’s video that is objectionable. Keep that other video in mind because it becomes important later. A man in a wheelchair comes forward and begins taunting the veteran. The veteran steps away from the wheelchair and places his sign on the ground leaning against his leg as he holds his flag. The veterans sign is actually placed where it is not visible from the street. There is another American flag being held by one of the professors, so the presence of his flag does not interfere with their protest either. Now the woman in white, who has been continuously badgering the Veteran’s son, uses the guise of moving a blue tupperware bin in front of his sign to mask her intent to grab it. Grab it she does and throws it into the street. When the veteran goes to retrieve it she stands on top of the sign and taunts him to strike her. She has now stolen his property and incited riot. The veteran pulls his sign from beneath the woman’s boots while his wife comes over to interject her body between him and the woman. The veteran walks back toward the sidewalk while a second woman, in a green shirt, comes charging up to the veterans wife and strikes her with the red sign she is carrying. The veteran’s wife moves her arm in a protective motion to fend off the sign and fend off this new woman. The sign then strikes the woman in white. At this point both women pile on the veteran’s wife punching and kicking. The wife, wearing an inflatable cast due to a leg injury, is caught off balance and falls to the ground. The veteran seeing what is happening spins around and grabs the woman in green to restrain her. In the meantime the woman in white continues to punch and kick the wife on the ground. Several male protesters grab the veteran and push him to the ground. Punches are reported to have been thrown by these protesters although they are not recorded on this video. The video stops for a minute while the son pulls the woman in white off his mother. The video resumes in time to catch a last kick the woman in white makes to the head of the veteran’s wife. This is one of the blows that caused the concussion the wife suffered. The camera pans around and the veteran can be seen on the ground, still restraining the woman in green, while the male protester in yellow is gripping both sides of the collar of his shirt from behind in the manner of a garrot around his neck. His hat and glasses are gone. The glasses were smashed in the street. The woman in white then approaches the veteran as he releases the woman in green and appears to launch an attack against him while he is restrained. She then wheels around and assaults the son, who is still videotaping, in a graphic exhibition of the violence endemic to ‘peace’ thugs. This recorded assault on a juvenile should have produced an immediate arrest by the police officers reviewing the video, yet they did nothing. It seems to me after reviewing the video that it was she who got exactly what she wanted. She was aggressive throughout the episode, she instigated the violence, she taunted and baited the veteran to try to incite violence, she assaulted the wife when the wife had not touched her, she kicked and beat a woman who was helpless in the street, she assaulted a juvenile. What else can she have wanted? Oh, wait, yes, she wanted to express how she supports our troops! So, when the police called her over to the other side of the street where the veteran was sitting on the curb with his injured wife, she spit on him! Yeah, that’s the ticket! That’s the kind of support the left showed to our Vietnam Veterans and exactly what they are showing to our next generation of veterans today. The two policemen arrived on the scene after the open hostilities had ended. One of the officers arrived with an attitude and that attitude did not improve throughout the time he was there or later at the police station. He allowed the protesters to taunt the veteran in his presence unhindered and then threatened to arrest the veteran when he responded verbally to the taunts. When the woman in white was called across the street by the police, and she took the opportunity to spit on the veteran, he did not threaten to arrest her. When he reviewed the video from the veteran’s son’s camera he decided that no one was going to be arrested even when it was pointed out to him that the lady in white had blatantly attacked a juvenile. Later in the police station this officer again displayed outright hostility to the veteran and threatened to handcuff him for inquiring why the woman wasn’t arrested for the assault on his son. The favorable treatment given to this woman begs the question. Who is she and what is her relationship to the police officers or any public person in the Borough of Edinboro? ….is an intelligent and vibrant student activist. She is passionate about human rights issues and the environmental issues! Now to the woman in black with the video-camera recording the event for the ‘peace’ protesters. It was pointed out to the police officers that the woman had recorded the entire event. Yet her camera was not impounded so that her video could be reviewed. In two photographs she can be plainly seen still holding her camera while standing next to the cop with the attitude, and then again in the background of the more reasonable officer while he talks with the guy in the wheelchair. Why was her camera not impounded? From her different vantage point it is assured that the video she took captured aspects of the action that were not captured on the video taken by the veteran’s son. Her video probably continued to run during the period when the son’s video is interrupted while the son is pulling the lady in white off his mother. To me, it would seem imperative in any thorough investigation that all sources of evidence be reviewed to determine the actual circumstances leading up to the assault, yet the police did nothing to secure that vital piece of evidence. There is a principle of jurisprudence in this country referred to as “equal protection under the law” from what I have seen, heard and read of this incident that principle was the first casualty in Edinboro. Updated 4/26/2008. The second video has been secured by the Edinboro Police. It was played for the veteran’s wife and shows many details missing from the original tape and the action which took place while the first video camera was turned off. It appears to corroborate the accounts written about here. Harassment charges are being filed against the Iraq Veteran and his wife and no charges are being filed against the thugs who assaulted them. How can the District Attorney justify this travesty of justice? A local news broadcast can be seen here. John Lilyea writes an excellent posting on how the failure of police to stem the unruly behavior of protesters in the Vietnam era eventually led to citizens having to enforce the boundaries of civil behavior themselves, not a pretty sight. Read the whole thing here. It turns out that charges ARE being filed against two of the ‘peace’ thugs. In a move that even the deranged left leaning media have generally avoided until now, the Howard Dean run Democratic National Committee has included in its new advertising campaign against our troops and their mission a segment of a jihadi ‘snuff’ film which portrays two American soldiers being blown up by an improvised explosive device. Mainstream media practicing their last vestiges of decency and common sense have refused to air videos of this type which are frequently available on jihadi recruiting websites around the world. The DNC, however, has retained no such vestiges and has, by including film made by terrorists to influence public opinion, openly allied with the their aims. The recent report out of Harvard on the ‘emboldenment‘ of terrorists by impressions of American sensitivity to casualties has been roundly ignored by the Anti-American types of the domestic insurgency. We can add Howard Dean and the Democratic National Committee to that list. Their public support of jihadi recruitment efforts can only cause additional U.S. casualties. They have chosen sides and theirs is not the side of our soldiers. Similar to the president’s economic stimulus package which rescued capitalism from itself, the journalistic stimulus package would protect New York Times readers from editorial instability, while ensuring full employment for reporters and editors whose product is no longer in demand. Intrigued? Read the whole thing here! 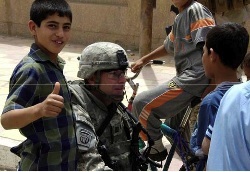 IA Soldiers taking our cue and handing out school supplies to the children; large weapon caches turned in, and many insurgents killed or captured. FOB KALSU – Members of the SoI turned over a weapons cache to CF south of Baghdad, April 25, consisting of 57 mm projectiles, propane tanks filled with homemade explosives and rockets at the Maskar Bunker Complex in Arab Jabour. Projectiles like those recovered have been used in the recent past to make pressure-plate IEDs, said Capt. William Lyles, assist. operation officer for 2nd BCT, 3rd ID, Fort Stewart, Ga. This is the third time this week SoI have turned munitions over to CF at COP Murray, including a 500-pound bomb turned in April 24, said Lyles. An IA soldier hands school supplies to a child, April 23 during an “Operation Junior Hero” mission in the Taji Qada, northwest of Baghdad. The Junior Hero program focuses on keeping children in school and encourages them to become future leaders of Iraq. BAGHDAD – April 25, in southern Baghdad, Soldiers from 1st BCT, 4th ID seized various materials used for constructing IEDs and home-made explosives while conducting a cordon and search op within the Bayaa community. BAGHDAD – MND-Baghdad AWTs and an UAV killed 5 criminals in separate air-to-ground engagements in the Sadr City district of Baghdad, April 26-27. At approx. 10 p.m. April 26, the operators of a UAV observed 2 armed criminals who were providing over-watch on a vehicle route, and were believed to be triggermen for an IED. An MND-B AWT was called into the area and fired a Hellfire missile, killing the 2 criminals. At approx. 10:30 p.m., MND-B operators of a UAV positively identified 2 armed criminals and engaged them with a hellfire missile, killing both. At approx. 1 a.m., April 27, the operators of a UAV observed 2 armed criminals who were providing over-watch on a vehicle route, and were believed to be triggermen for an IED. A MND-B AWT was called into the area and fired a hellfire missile, killing 1. The second left the scene prior to the AWT engagement. BAGHDAD – Iraqi Soldiers advised by U.S. SF, detained 17 suspected AQI terrorists in the as-Sa’diyah villages of Sama and Rabia, April 25. The IA soldiers conducted a cordon and search patrol of the area in order to disrupt terrorist activities. During the patrol, 17 men believed to be AQI members were detained for questioning. The patrol also confiscated more than 30SPG-9 rounds, 40 various types of mortars and over 100 mortar fuses. An anti-tank mine and an IED were also found and destroyed on site. BAGHDAD – A MND-Baghdad UAV killed 2 special groups criminals at approx. 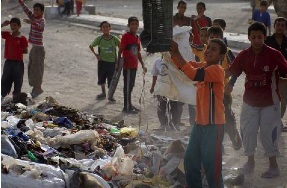 3:30 p.m., April 26, in the Sadr City district of Baghdad. The operators of the UAV observed as 2 criminals loaded a PKC machine gun into the trunk of a vehicle at approx. 2:40 p.m. The UAV operators then watched as 4 criminals unloaded the machine gun, as well as four AK-47 assault rifles, into the trunk of another vehicle. The UAV followed, then engaged that vehicle with a Hellfire missile, destroying it and killing the 2 occupants. At approx. 2:30 p.m. Iraqi Soldiers seized a munitions cache of artillery rounds ranging from 82mm to 120mm rounds in western Baghdad. At approx. 3:20 p.m., IP seized a munitions cache in the West Rashid district of Baghdad. The IP captured blocks of C4 explosives and 107mm rockets. CAMP PHOENIX, KABUL, AFGHANISTAN – The command of Combined Joint Task Force Phoenix (CJTF-P) was transferred Sunday from the South Carolina National Guard’s 218th Heavy Separate Brigade to the New York National Guard’s 27th Infantry Brigade Combat Team. Colonel Brian K. Balfe, the incoming commander of CJTF-P VII and the 27th IBCT officially succeeded Brigadier General Robert E. Livingston during a Transfer of Authority Ceremony in Patriot Square, Camp Phoenix in Kabul, Afghanistan. “Members of the 27th Infantry Brigade Combat Team are proud Soldiers, with a storied history,” said incoming commander, Colonel Brian Balfe. “We are honored to be here as guests of the government and people of Afghanistan. We believe in our mission. It is a privilege to have been called to perform it,” he said. FORT DRUM – Governor David A. Paterson today addressed nearly 1,100 soldiers of the 10th Mountain Division as they prepare in the coming days to deploy to Iraq. The 15-month deployment will be the division headquarters’ first tour in Iraq, having previously deployed to Afghanistan from 2003 to 2004 and most recently from 2006 to 2007. The 10th Mountain Division headquarters will be responsible for command and control of coalition military forces in south and southeast Baghdad, as well as Karbala, Najaf, Babil and Wasit provinces. Our troops are receiving improved armor vests; working on rehabilitating Iraqi detainees, and reuniting them with their families; caught insurgent cell leader after 3 years of evading capture; IA Quick Reaction Force having continued great success; and nice to see the IA Air Force in action! 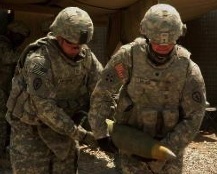 CAMP STRIKER – A tip led Iraqi Soldiers to a cache of IED-making materials southwest of Yusifiyah, April 24, comprising of 19 RPG-7 rounds, 15 hand grenades, 10 60mm mortar rounds, 5 unidentified 120mm rounds, 4 cases of .50-caliber ammo, a case of machine-gun ammo, 10 handheld radios, 8 switch boxes and multiple trigger components. Pfc. Jacob Miller shows off his new body armor after receiving his Improved Outer Tactical Vest April 18 at FOB Rustamiyah. The improved vest is part of the Army’s mission to provide Soldier’s with the most advanced protective gear available while also improving the comfort and mission effectiveness of new equipment to the force. Miller is a MP Soldier with the 59th MP Co, 95th MP Bn, 18th MP Bde. BAGHDAD – Soldiers from the 3rd Sqdrn, 7th Cav Regt, 2nd BCT, 3rd ID, hosted the event that marked the end of detention for Iraqis. “It shows a great deal of unity among the Iraqi people, Army, police and ourselves, and only together we will be able to reach sustainable security,” said Lt. Col. Jeff Broadwater, sqdrn. cmdr. The citizens arrived for the ceremony, and after making their entrance, they were greeted by family members friends with hugs, kisses, and candies tossed in the air, which is a celebratory custom in Iraq. The former detainees placed their hands on the Koran and took an oath to support the Iraqi constitution, and signed a commitment to avoid involvement in any criminal activities. “Since they took the oath in front of their families, neighbors and police, the chances of having them committing a crime are less,” said 1st Lt. Jose Rivera, assist. adjutant with the 3-7 Cav. Regt. Lt. Col. Broadwater conducted the opening of the ceremony, while the oath and signature of release was officiated by a local Sheik and an Iraqi Police official, which made the ceremony truly a combined event. “The goal of the re-integration is to create a sense of community,” Rivera said. 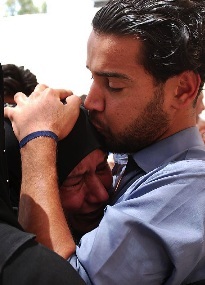 An Iraqi citizen, and former detainee, kisses a family member. An Iraqi citizen patiently waits with his daughter to be called to sign his official release documents at COP Apache north of Baghdad. BAGHDAD – April 24, IA advised by US SF, in the Jazeera Desert, conducted a cordon and search patrol in order to identify insurgent lines of communication in the area. During the patrol, ground forces saw a truck which appeared to be stuck in the sand. The 2 individuals dismounted the vehicle for a few seconds but quickly moved back to the truck, and shot at the IA soldiers with AK-47 assault rifles. IA returned fire and both were killed. In another op in western Ninewa, IA Soldiers conducted a cordon and search patrol to disrupt insurgent safe havens in the area. Multiple villages suspected of insurgent activity were searched simultaneously, resulting in 3 suspects being detained for questioning. Both of these ops will likely disrupt insurgent safe havens and will show the capabilities of the IA to conduct multi-brigade cordon and searches in the area. BAGHDAD – The Fallujah SWAT unit, advised by U.S. SOF, detained an insurgent cell leader and 8 others in an op northeast of Karma, April 25. Fallujah SWAT conducted the op to capture the leader of an insurgent cell who has evaded CF for the last 3 years, and to disrupt the activities of his network. The cell leader is suspected of planning and launching IED attacks against CF in the area and recruiting others to join his terrorist network. Eight other suspects were detained for further questioning. BASRA – Quick Reaction Force 1, from the 1st IA Quick Reaction Force began the latest stage of Op Charge of the Knights, April 25. The last stage of the op is clearing and searching homes in al-Huteen. Al-Huteen, part of the Five Mile Market neighborhood of Basrah, had been considered a stronghold for criminal elements of the Jaysh al-Mahdi militia. 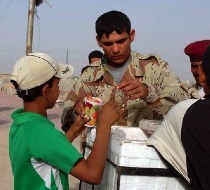 But, when the soldiers of QRF 1 moved into the city, the local citizens actively welcomed and cooperated with them. “The extremely successful ops earlier this month by the IA in al-Quibla and al-Hyyaniyah showed the people that the army is here to help them by getting rid of criminals and outlaws,” said Capt. Daniel C. Lammers, 1st IA (QRF) MiTT asst. ops officer. 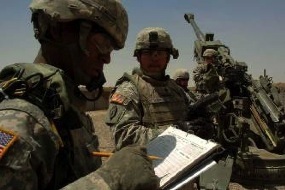 While Marines and Soldiers embedded with the Iraqi units as advisors during the op, the IA took control of the ops themselves from planning to execution. The searches themselves turned up several weapons caches including mortar rounds, RPGs and launchers, and IEDs as well as several detainees suspected of criminal activity. BASRA – While conducting clear and search ops in the al-Huteen neighborhood of Basra, 1st IAQRF discovered a substantial cache in an outdoor prayer area, April 24. The cache consisted of 8 IEDs, 4 RPG launchers and 24 warheads, 3 PKC machine guns, more than a 1,000 rounds of machine gun ammo, a 120 mm system, various IED making materials, and explosives, along with more than 20 mortar rounds of various sizes. The IA Air Force delivers supplies to CF in the Basra region, April 20. 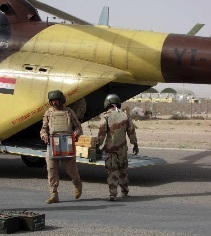 An Iraqi military helicopter drops off 700 pounds of ammunitions, 20 pounds of vehicle repair parts, 150 pounds of medical supplies, and U.S. mail to a camp outside of Basra. 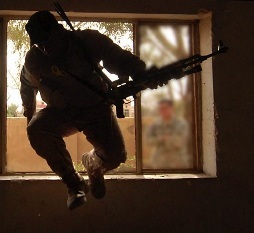 An Al Kut SWAT member jumps through a window to clear a house during Close Quarter Battle training in Al Kut. U.S. SF act as trainers to SWAT forces across Iraq.